This juice can trinket box can is perfect for holding rings, coins, or tiny treasures. Here is what you will need. 1. After opening a juice can of lemonade or orange juice, save the metal lid. 2. Wash and dry the empty can. 3. Measure up from the bottom of the can 2 - 3 inches, however deep you'd like it to be. Draw a line all around and cut the cardboard with a serrated knife. If you have slightly ratty edges, carefully sand them smooth. 4. Cover the cardboard with wall paper or fabric, gluing and smoothing it. Let dry. 5. Add embellishments, trim or whatever you choose. 6. Leave the lid silver, or paint it a complimenting color, hot glue a decorative button to the center of the lid. 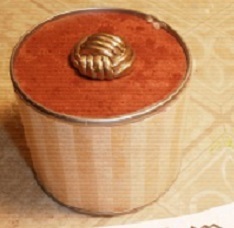 A perfect recycled craft, a juice can trinket box! How clever! 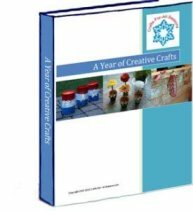 Thank you for sharing this wonderful craft!